Anything that is exposed to the weather will eventually wear down. This is true for patio furniture, swing sets and tool sheds. Those are all the types of things that are not easy to get rid of. Before winter comes, you might want to remove those items from your yard before they become a hazard. The best way to take care of backyard shed removal is to bring in the pros from Junk King Detroit. Before Junk King starts any job, they assess what’s going to be loaded onto the truck. Often that assessment requires dismantling of an object. That certainly holds true with the backyard shed. This is not something that can just be lifted and loaded onto a truck in one piece. Instead, the Junk King crew will have to take it apart sometimes plank by plank. Actually, taking apart something will allow it to take up less room the truck and that will mean bigger savings for you. That’s because the Junk King fees are based on how much truck bed space all your trash will occupy. It will either be one third, one-half, one quarter or the entire truck. Whatever that amount is you’ll know before the job begins. That flat fee includes the dismantling time as well. It’s the only fair way to take care of this type of work. Even though shed removal might be your focus for hiring Junk King Detroit is no reason why they can clear out the rest of your unwanted clutter that same trip. Remember you’ll have a moving crew and a big truck. One of the kinds of things around your house that you would like to get rid of? Take full advantage of this team by having them bring up things from the basement or down from the attic. When Junk King says they do all the work, they mean that. It doesn’t matter how heavy something is or whether they have to climb stairs. All that matters is that you want the item taken away. 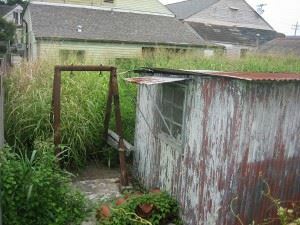 Backyard shed removal and junk hauling doesn’t have to be complicated when you give that job the Junk King Detroit. This entry was posted in Detroit Junk Removal and tagged backyard shed removal, junk, rubbish on August 27, 2017 by Junk King. Last updated August 27, 2017 .